Our HM-Analyzer maps from one to 15 inertial sensors to various segments of the body (such as trunk, pelvis, arms, etc.) in order to obtain joint angles according to ISB - International Society of Biomechanics (ISB angles are also anatomical angles) or according to AAOS. The software and system are totally scalable allowing you to use any number of sensors as required. The skeleton which is used for visualization can be adjusted according to the subject's anthropometry. The software takes care of joint definitions and conversions. The user simply needs to identify the segment that is mapped to the specified sensor. The application synchronizes the data automatically. The user can then perform various analyses within HM-Analyzer or export data. Processing and analysis of off-line or data stored on the built-in inertial sensor memory is also handled by HM-Analyzer. The calibration procedure consists of the user selecting either the T-pose or I-pose (posture) and clicking "Calibrate" or using the auto-calibration option. Animation allows you to replay a recording or an offline imported file. You can zoom in and out on the graphs using the mouse wheel. Recording duration time can be set manually or automatically by specifying the start and end recording time. HM-Analyzer includes synchronization capability (requires optional hardware Synch kit) with the Biometrics DataLOG (as slave or master) with EMG, force plates as well as other sensors and accessories. As well, there is an option to synch with a webcam. The DATS (Data Analysis Tool Set) module is included and performs a variety of joint angle analysis, filtering and data export. The DATS module provides a graphical user interface (GUI) to perform data analysis. The analysis can be done with streaming (real-time) data or with data that was previously recorded. The interface uses a graph layout to create various analyses. Tools are available to easily connect the graphical blocks. Data processing block layouts can be saved for reuse. 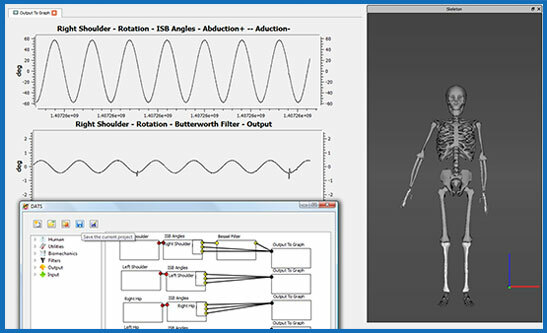 The DATS module includes various filtering options, biomechanical tools to calculate joint angles (according to the ISB or AAOS) as well as various signal processing tools. DATS also includes a variety of data filtering options that can be applied which include Butterworth, Chebyshev (1 & 2) and Bessel. Graphical displays can include raw data such as acceleration or gyro data or computed joint angles according to the AAOS or ISB. Saved analysis can be saved for reuse or future modifications. Capture motion orientation information from inertial sensors. Easily map segments of a 3D model skeleton to inertial sensors and mappings can be saved to be reused in subsequent data acquisition to save time. Dynamically display Euler or Quaternion orientation data as a scrolling, 2D graph. Record multiple recordings each can be subsequently analyzed further and animated. Display recorded data as a static, 2D graph. The center of mass and center of gravity is displayed on the 3D skeleton. Apply filters (APDF, Bessel, Butterworth, Chebyshev I, Chebyshev II, Differentiation, Rectification, Acceleration and Velocity) to streaming (real time) data or recorded data. DATS calculates anatomical angles of a selected limb and displays the data in real-time. ISB (International Society of Biomechanics) and AAOS conventions are supported. Data can be synched with webcam. When using DATS, data can be exported to HDF5 format, CSV & C3D. Threshold alarm: Values outside the threshold are displayed in red in the real-time graphs. Repetitions: The software will provide a total of repetitions defined by an algorithm. As well, each repetition can be visually identified on the graph. New position calibration options including horizontal for analyzing postures when the subject is in a horizontal position. Range of Motion scoring: The user can assign their own ranges of motion to score the movement against. This scoring is by segment and the user can assign the joint angle ranges with a corresponding color code assigned by the analyst. HM-Analyzer is a trademark of NexGen Ergonomics Inc.